Welcome to Small Success Thursday, hosted by CatholicMom.com! This is the day we take a look at what goes right in life, no matter how small, and celebrate those successes. 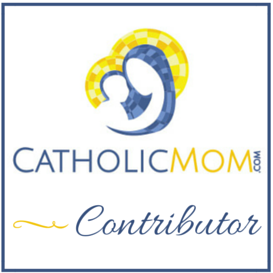 Share your own successes and read the other submissions at CatholicMom.com. Life has been crazy busy again. I can’t seem to make it stop, and I have been worrying about carving out family down-time. For the last several weekends, though, it’s been non-stop activity: January 30-31 we had a bake sale to benefit the homeschool co-op’s yearbook project. The next weekend was a chocolate/bake sale at our parish to benefit the youth group. The next weekend my girls went to the Diocesan Youth Conference in Richmond and our Dominican chapter had Mass and a reception of new members followed by lunch. This weekend, I have a Dominican chapter meeting. Next weekend the youth group is selling donuts as a fundraiser for the summer camp my girls are both going to. I think I’m going to go crazy. However, I’ve survived so far, which is the success I am pulling out of this whole thing. That, and the fundraising helps defray costs for the Life Teen camp. We survived two snowstorms, which each dropped roughly a foot of snow on us. We have already surpassed last year’s snow totals, and last year was above-average. My back and I will be thrilled if I don’t need to shovel the driveway again. I finished our taxes, and I helped my 17 year-old do her very first tax returns. A small moment of panic set in when Turbo Tax said, “Because you are a minor, your parents may need to claim your income on their taxes.” Thank God, that was all I heard of that. But her taxes were done in 30 minutes, and that included downloading the software update. I don’t know if I should count it as a success or not, but I’ve given up on keeping Frodo Waggins off the furniture. He’s now allowed on the couch, and he sleeps outside his kennel at night (curled up on said couch), which eliminates his 2 AM wake-up calls. He also sleeps longer in the morning, so he’s not begging to get out at 5 AM, either. Also, he’s kind of nice to cuddle with when he settles in. He’s a sweet dog. I miss living in the Maryland/VA/DC area. Sigh. No snow here in Fort Worth. BOO. Love your dog’s name. And yes, deferred costs are always good. Great post. p.s. the Youth leader talked me into baking for a bake sale this weekend, that will benefit a high school group. She says someone will do it for us too when the time comes…. so… I bake. Sigh.